96 Hours of Direct Action - WE.WILL.NOT.COMPLY. We are pleased to introduce you to the inaugural issue of The Storm, the newsletter of the APTP community. We will send out The Storm on a regular basis to give our members and supporters an update on APTP’s work and ways to get involved, highlight important news and events, report back on past actions, and spotlight community-led models of taking care of ourselves, free from police terror. Each issue will feature a column from one of APTP’s founders, who will share their wisdom and reflections about a particular topic or theme. This issue’s theme is Tasers. APTP co-founder Cat Brooks breaks down how Tasers are yet another deadly tool the State uses to kill Black and Brown people. The issue continues with an interview Cat conducted with LaMesha Smith Toney, whose husband Marcellus was tasered to death by Oakland police in September of this year. The rest of this issue discusses how we are fighting back, and how folks can join the struggle. In the words of APTP co-founder Tur-Ha Ak, "Don't fear The Storm ... Be The Storm." Can a device that is designed to deliver 50,000 volts into a person for five seconds truly be considered “non-lethal”? According to Amnesty International, more than 500 people have died in the United States since 2001 after being shocked by police with Tasers. Tasers accounted for approximately 5% of officer-related deaths in 2015. Most of the people who died following an encounter with a police officer who used a Taser were unarmed. 40% of the people who died were Black. On September 28, 2017, the Oakland Police Department responded to a traffic incident that took place near the intersection of 41st and Foothill. Upon arrival they found Marcellus Toney, 45, who had been in the accident. Their encounter with Mr. Toney quickly escalated and he was Tasered. He would later be pronounced dead. When he died or where is still under investigation. On the heels of this tragic incident, the San Francisco Police Commission voted to approve the utilization of Tasers by the San Francisco Police Department. Tasers are touted by law enforcement as a less lethal means of subduing a person, but - according to a recent Reuters report - there simply is not enough research to make this determination. And the ways in which people respond to being tased vary widely -- from no impact at all to, in far too many instances, death. 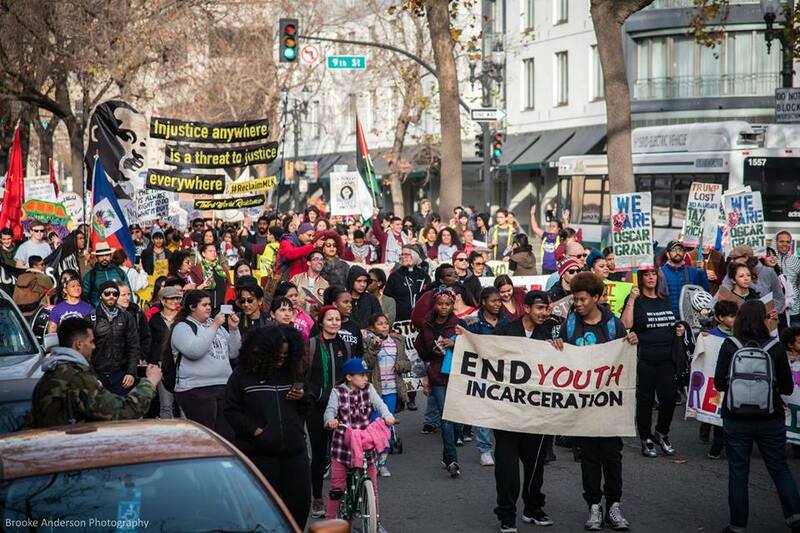 Organizationally, our mission is to eliminate state terror from communities of color. We have no interest in meek reforms that do nothing to reduce the ability of the state to harass, kill, incarcerate and abuse our communities. We refuse to be sold the lie that Tasers keep us safer. All the SFPD has done is provide law enforcement another deadly tool to utilize in the occupation of our communities. Natasha McKenna was a 38-year-old woman in Fairfax County, Virginia, who suffered from schizophrenia. During a particularly bad episode, police tried to transfer her to a different facility. She died after being tased four times. 39-year-old Donald Ivy, who also suffered from schizophrenia, was tased to death by police officers in Albany, NY, after an encounter with police escalated. An 18-year-old graffiti artist in Miami named Israel Hernandez was tased to death by police while fleeing from them after being caught tagging an abandoned McDonald's. In Virginia, Linwood Lambert was tased by three officers a total of 20 times over roughly half an hour. Though they were steps away from the hospital entrance, officers shackled his hands and feet and took him to jail rather than providing him with medical care. He died in police custody a short time later. In Hayward, on May 23rd 2014, 46 year-old James Greer went to purchase a lottery ticket when he was pulled over by the Hayward Police Department. The department alleges they pulled him over because the officer suspected he was driving under the Influence. Before the sobriety test would conclude, several more officers would arrive on the scene, including the BART police department, and James Greer would end up dead. Tased to death. Between 1983 and 2017, U.S. law enforcement killed more than 1000 people with Tasers. 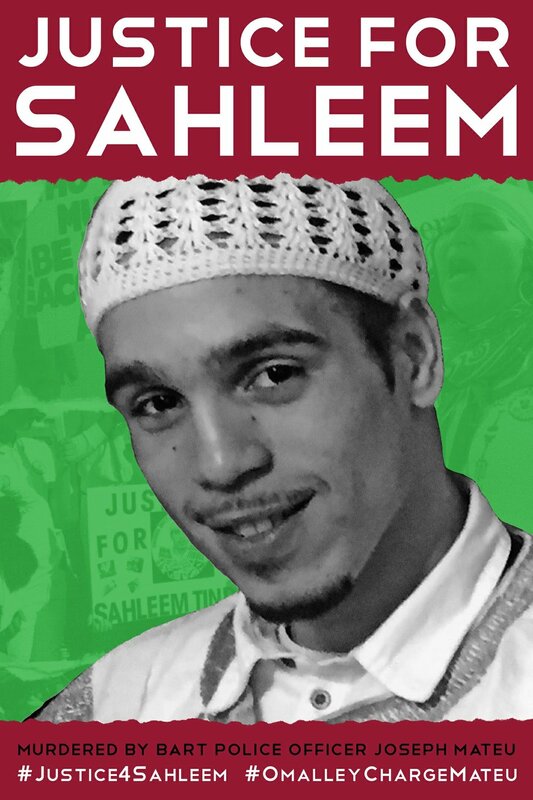 On the afternoon of January 3rd, 2018, 28-year-old Sahleem Tindle, a beloved community member and father of two, was shot and killed by BART police officer Joseph Mateu near the West Oakland BART station. Initially, BART and the media reported that Sahleem was holding a gun and did not comply with police orders, but bodycam footage proves this was a lie. Now the family is fighting for justice. It wasn’t until February 7th, 2018 that Sahleem Tindle’s family, including mother Yolanda Banks Reed, along with their attorney John Burris, were able to review Mateu’s bodycam footage. It reveals that Mateu never identified himself while running across the street, gun drawn, and then shooting an unarmed Sahleem (who was involved in a scuffle with another man) three times in the back. The media also failed to report that Sahleem was with his fiancée and two young children. On February 13th, the family held a rally at West Oakland BART to protest the false narrative, and to demand that the officer be charged and the footage be released. At that time, the video was being withheld. Mateu, however, was cleared for duty just two weeks after murdering Sahleem. BART released the full video on February 21st—but only after a portion of the footage was leaked. After the video was released, BART police chief Carlos Rojas appallingly called Mateu a hero. “I call that courage,” he said—a statement many felt was a slap in the face to the Tindle family. At the BART police citizen review board meeting on March 12th, family and community members expressed outrage at the chief’s words, as well as his lack of empathy and condolences for the family. “After we get justice for Sahleem—and it is coming—we want you gone, too,” one mother said to Rojas. “There’s a code of ethics. There’s a code of the people. There’s a code of humanity. You don’t shoot people in the back,” said Karim Mayfield, Sahleem’s brother. “I know you’re a human being,” said Kavin Tindle, father of Sahleem, to Rojas. “Do you have a heart? Why did your officer shoot and kill my son? !” By the time the meeting was adjourned, the board had moved to write a letter requesting that Rojas be prevented from making further harmful statements. During public comment, BART police officer S. Christ played Words with Friends on his phone. With a media narrative that began with lies, and no action yet from the agencies investigating Sahleem’s murder, the family and community are steadfast in the fight for justice—attending standing-room-only meetings of BART’s board of directors, gathering at District Attorney Nancy O’Malley’s office to demand that she press charges against Joseph Mateu, and rallying in the rain outside OPD to pressure them to arrest the murderer of Sahleem Tindle. The family and community of Sahleem Tindle demand that BART police officer Joseph Mateu be fired, arrested, charged, prosecuted, and convicted. A civil claim has been filed against the BART police. — Justice for Sahleem! Justice for Prince Sahleem! On January 23rd, 2017, 21-year-old Angel Rico Ramos was shot and killed by a Vallejo police officer at his family home. Police reports that Angel had a knife contradict the family’s account of what happened—that Angel was unarmed when the cop shot him several times. The family has been fighting for justice. 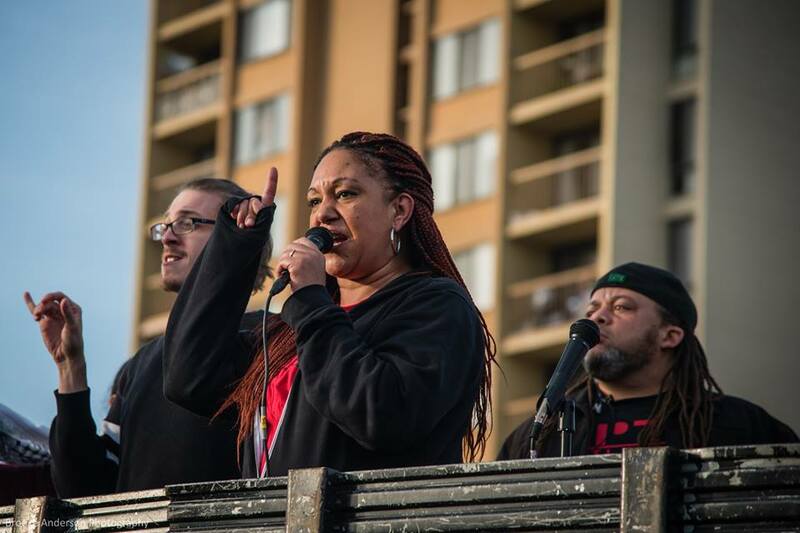 Angel’s sisters spoke out at the 4th Annual March to Reclaim King’s Radical Legacy in Oakland on January 15th, 2018. 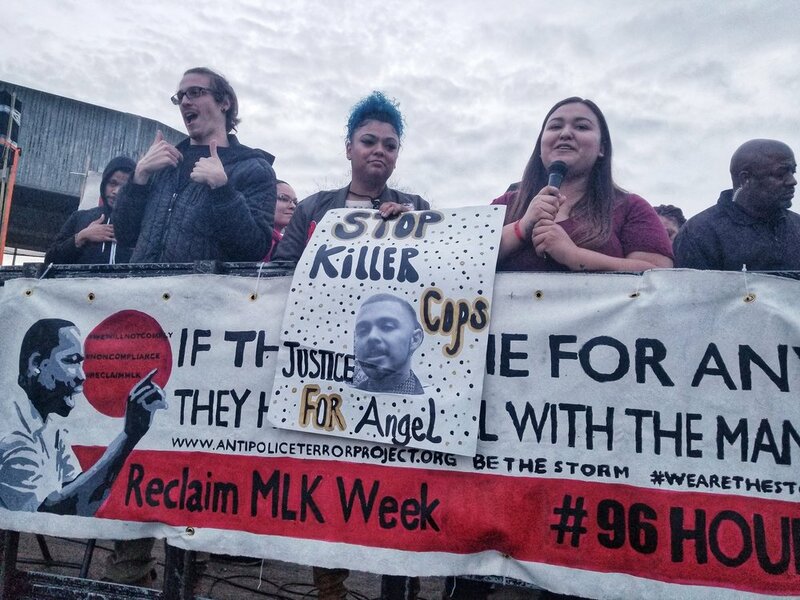 And on January 21st, in spite of facing police intimidation and threats (including a police dog barking over a loudspeaker), the family held an event to Remember and Honor the Life of Angel Ramos, and marched in the streets of Vallejo. The family continues to fight. A civil lawsuit has been filed against the city of Vallejo, naming officer Zachary Jacobsen as Angel’s killer. From February 17th to February 24th Community READY Corps organized Oakland’s first annual Black Solidarity Week. 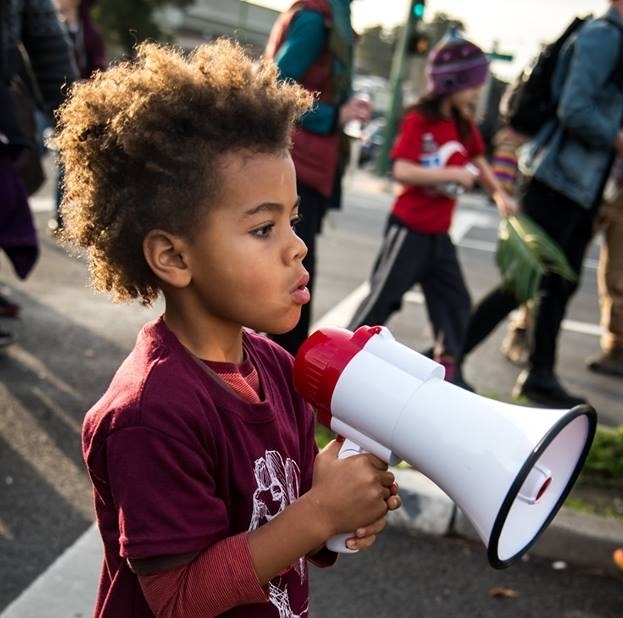 The week kicked off on February 17th with a historic march and rally in deep East Oakland in tribute to Minister Huey P. Newton on his birthday. Over the next week community members, activists, and a coalition of organizations hosted 13 different events. These events were designed to foster self-determination and solidarity among a variety of components: Politics, Economics, Family, Health, Education, Art, Media, Traditions & Ways, and Self Defense. Some of the events were joyful celebrations, others had educational purposes, and others were in direct response to state violence, such as the powerful turnout at the BART Board meeting where community members demanded justice for Sahleem Tindle, a young Black man murdered by BART Police. We recommend watching the powerful videos about what solidarity means for people here. 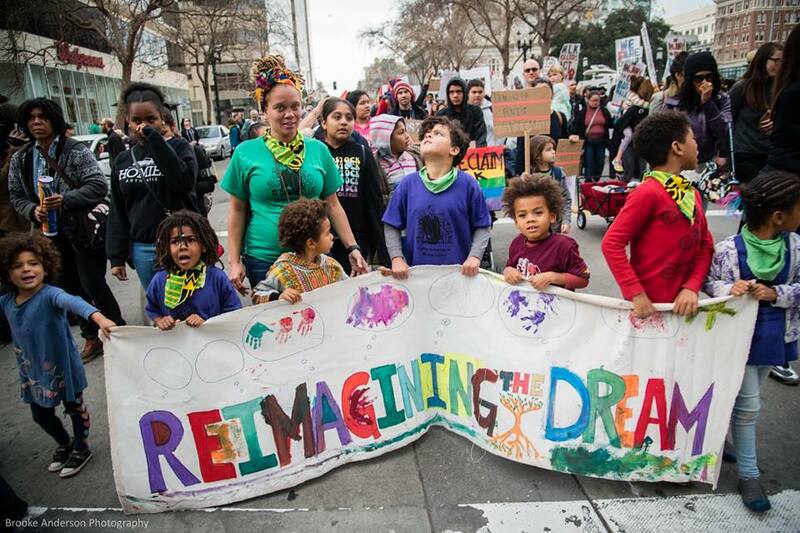 For the fourth year in a row, APTP led the Bay Area in taking to the streets for #96 Hours of Direct Action to Reclaim MLK’s radical legacy. Thank you to everyone who came out and stood with us against white supremacy, against state-sponsored terror, and against development over people. For four years running, APTP put out the call -- and the community answered it! The week was beautiful and inspiring. From January 12th through 15th, we showed the agents of our oppression -- from 45 to Oakland Mayor Libby Schaaf -- that WE WILL NOT COMPLY. On January 12, actions focused on combating state-sponsored violence, including a demonstration against sexual violence at OPD, an agency known to harbor child rapists. The next day focused on Housing as a Human Right -- and we took this fight directly to the powerful. A coalition of activists and organizers, led by APTP, occupied the lawn of Mayor Libby Scaaff, setting up camp to demand that she create an immediate pathway to permanent housing for all Oaklanders. Specifically, we called for defunding OPD by 50% and redirecting those monies to provide permanent housing for houseless and housing-insecure people, closing landlord loopholes, and that all development projects be required to hire Black Oakland residents in proportion to their percentage of the population. This action was also in solidarity with the Coalition to Defend Aunti Frances, an elder, former Black Panther, disabled, long-time community activist who runs a food program in North Oakland, and who is now facing a no-fault eviction by her predatory property owners. 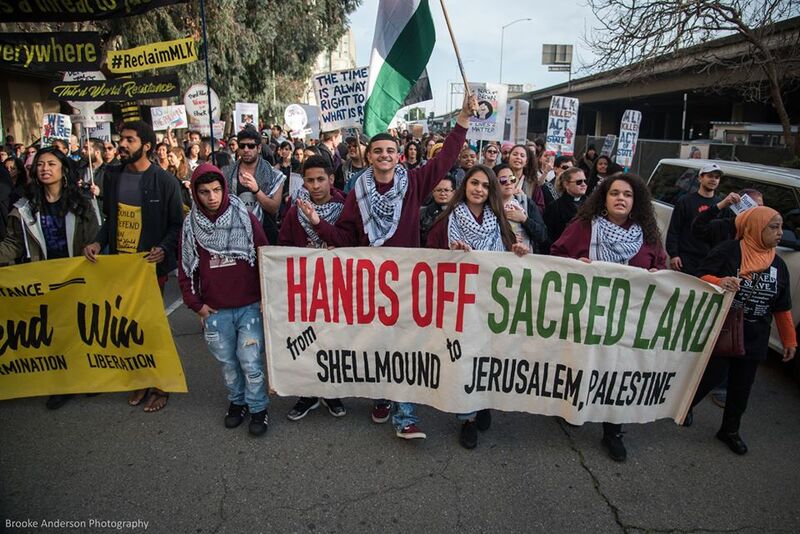 Actions on January 14 focused on Indigenous and International Solidarity, including: a protest at the West County Jail/Immigration and Customs Enforcement (ICE) Detention Center in Richmond; a prayer at the West Berkeley Shellmound; a teach-in by Third World Resistance on Dr. King’s resistance to racism, war and capitalism; and a #DefendTPS! [temporary protected status] rally for people from El Salvador, Haiti, Sudan, and Nicaragua. On Monday, January 15, we reclaimed MLK Day. 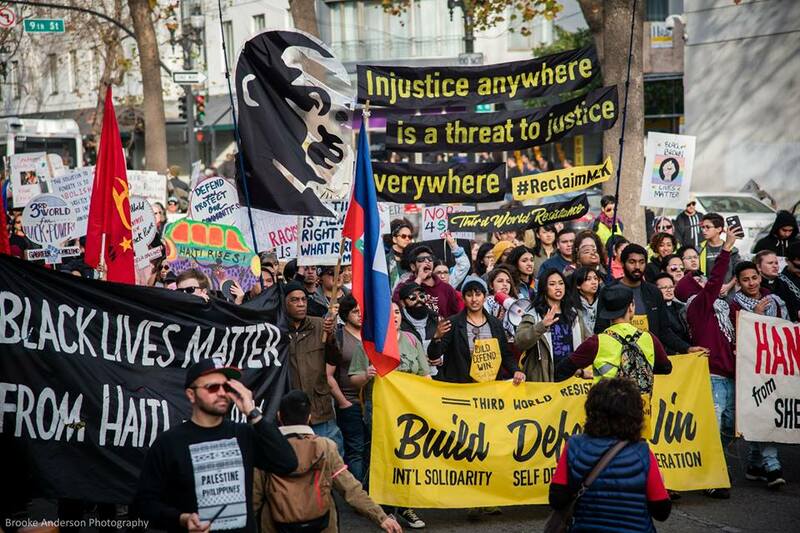 More than 2,000 people gathered in downtown Oakland at Oscar Grant Plaza and marched to West Oakland, through the Acorn neighborhood, a longstanding Black community. Our powerful, energetic, boisterous and militant march concluded near the West Oakland BART station, at the site of the murder of Sahleem Tindle by BART police. I am not convinced, and you will never convince me that the only answer is to have another dead Black man on the streets of Oakland. There are alternatives to murdering our People, and we are in the process of developing those alternatives ourselves. In 1973, Herman Bell, a member of the Black Panther Party and the Black Liberation Army, was arrested for allegedly killing two New York Police Officers Joseph Piagentini and Waverly Jones. The first trial resulted in a hung jury. To remedy that, the prosecution made a secret deal to drop charges against one witness in exchange for testimony and called another witness who had been tortured by the New York City Police Department until he agreed to testify against Bell. That witness, Ruben Scott, told the judge he had been tortured and whatever he said on the stand would be a lie. The judge reported that to the police who tortured him once again. As a result, Herman Bell, along with his comrades were convicted for the deaths of the police officers. Bell was sentenced to 25 years to Life. Herman Bell spent 45 years in prison. During that time, he mentored other inmates, received two college degrees, worked with people on the outside to create food programs and so much more. Mainstream media is falsely reporting that Bell is getting an early release. He is actually being released 20 years after he could have been. If, and it is a big IF, we are to believe that America believes that prisons are supposed to be institutions of rehabilitation. Then Herman Bell should be the perfect candidate for parole. But the Police Officers Benevolent Association, Mayor De Blasio, the New York City Police Department and others are infuriated with the decision and organizing to keep Bell incarcerated. If you are able, please take 20 minutes to complete the “Justice Study” today. Launched on March 5, the Justice Study is a project of the Do No Harm Coalition. This coalition is trying to get 100,000 people to take the survey about how state violence has impacted their lives. The data will then be used to make a case that state violence and police terror are public health issues. We must dismantle these institutions of state violence! If you or your loved ones have been impacted by police terror, the Justice Study is asking for your voice. APTP First Responders Training Guide is Now Online! Developed by APTP’s First Responders team, our Training Guide describes APTP’s model for supporting families impacted by various forms of police terror and documenting abuses by police throughout the Bay Area. After an incident of state terror, we connect impacted families and community members with resources and legal referrals. We organize to respond to police murders and incidents of excessive force because we believe in the need to defend ourselves and our communities from violence. This Guide was designed for APTP Trainings. We encourage you to personalize this Guide in your efforts to eradicate and heal from state sanctioned violence in your communities. We do ask that you credit APTP for the model itself. APTP is available to come to your community and offer and in-person training. We are full-swing into our monthly donor drive. Grassroots fundraising is crucial because even when funding fads wane, our steady individual donors and members are here to support the work that APTP does. If you are able to become a monthly donor, please sign up at antipoliceterrorproject.org by going to "Donate Now" and checking the box to become a monthly contributor. You can also send us checks if you prefer that. Your support makes it possible for the work to continue and grow! Right now, we are running a promotion where you can sign up to become a monthly donor at $20 or more per month for at least 3 months and you get a brand-new APTP hoodie! These beautiful, soft hoodies were made with the help of local business Merch Monster (based in Oakland) and feature our signature logo on the front and back. Sizes S - 2XL. Get yours today. When you sign up to be a monthly donor, just email annie.aptp AT gmail DOT com with your desired size of hoodie and we can arrange getting it to you. If you cannot sign up to be a monthly donor at this time, you can still buy a hoodie! They are $35 each. Again, please email annie.aptp AT gmail DOT com with your size and how to get it to you. Checks can be made out to "Anti Police-Terror Project" and sent to 1201 Martin Luther King Jr. Way, Suite 200, Oakland, CA 94612. If purchasing a hoodie, please include information about what size and how we can get the hoodie to you. Thank you so much to everyone who supports APTP in whatever ways you can!